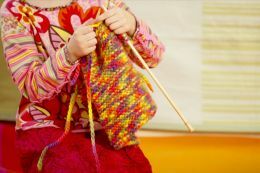 I've just read an article about a very interesting Handwork Studio for kids where kids spend time learning crafts like knitting and machine sewing. What a wonderful alternative to video games and TV. I am not saying that TV is bad. No. It's OK to watch it occasionally. And there are many educational and fun video games as well. But creating something with your own hands gives a different experience, a sense of accomplishment. If we keep teaching kids basic crafts from an early age (like our great-great-grandmothers taught our great-grandmothers) we might cure next generation from drugs and anger.